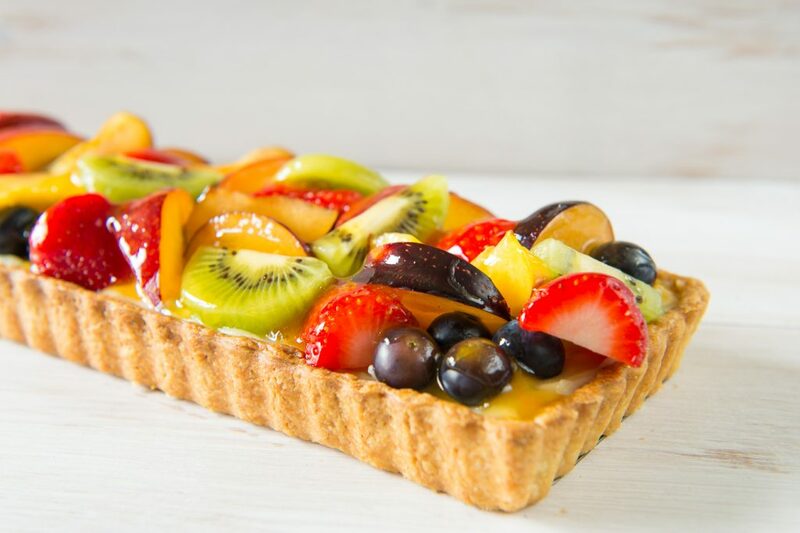 This gorgeous fresh fruit tart will brighten up any table, and looks so fancy and professional that your friends will think you’ve been secretly training to be a French pastry chef in your spare time. Its deliciously fresh and light, and makes for a dazzling dessert or stunning tea-time treat. What better way to get one of your 5-a-day? I love a mix of bright colours so I went for a variety of different coloured fruits. You can, however, use any fruits you like. How about a mixed berry tart with raspberries, blackberries and blueberries? Or let one fruit shine on its own e.g. a strawberry tart. The options are endless! Just remember that fruits in season always taste best. The great news is you can make both the pastry and the crème pâtissière a few days in advance. Then just bake and assemble the tart on the day you are serving it. Roll your pastry out evenly to approximately 4mm thick. Carefully fit the pastry into the tart tin, pressing well into the edges (there may be some leftover). Roll your rolling pin across the top of the tin to smoothly remove any excess pastry on the edges. Preheat the oven to 200°C. Prick the pastry several times with a fork. Place a piece of baking paper or foil over the pastry and fill with baking beans/uncooked rice/lentils. This weighs the pastry down during baking. Bake for 15 minutes, then remove the paper and baking beans/rice and return to the oven to bake for a further 5 minutes until crisp and golden. Set aside to cool completely. Once the pastry has cooled, spread or pipe your cooled crème pâtissière into the tart shell. Slice your stone fruit and kiwi fruit, and halve your strawberries. 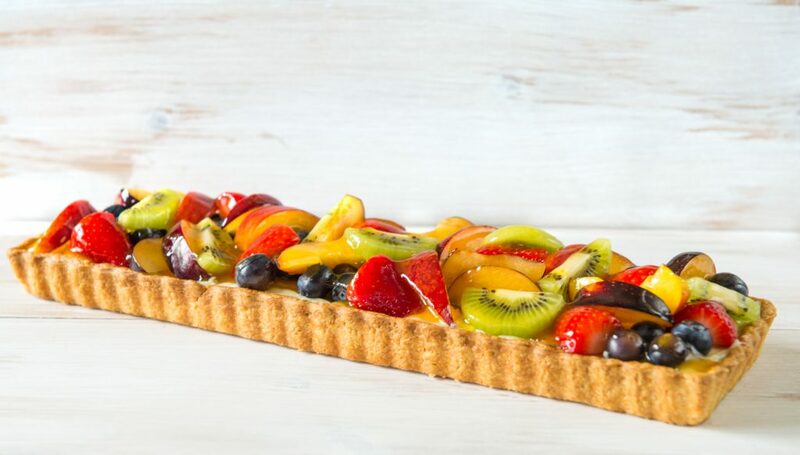 Arrange the fruit on top of the crème pâtissière. To make the glaze, gently heat the apricot jam and water until melted and smooth, then use a pastry brush to brush the glaze all over the fruit. 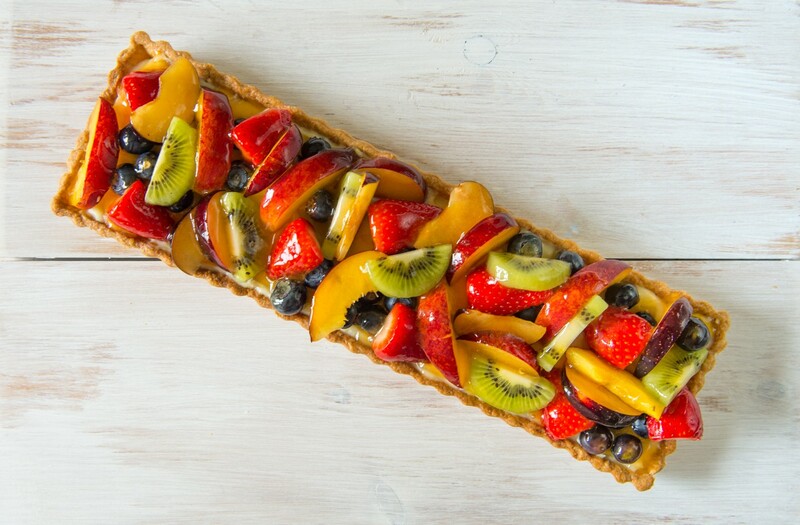 Keep the tart in the fridge until ready to eat. Most delicious if eaten on the same day!